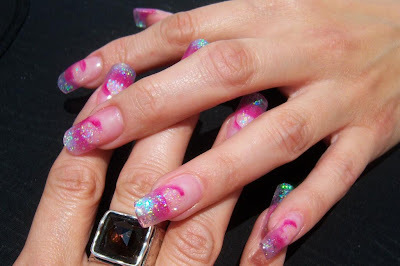 Acrylic nails are wonderful, however, the success that you have with them is up to YOU and your at home care. Too often I encounter people who have acrylics that do not take care of them and it creates more work for their technician as well as limits their ability to fully enjoy having beautiful nails. First, quit picking and playing with them. So often I can tell that someone is picking their nails. It's like the dental hygienist knows if you haven't flossed. I will see someone picking right if front of me and say something only to hear "That's not picking!". Ah, yes it is. Picking, is picking at edges, running your nail under the free edge, separating the nail from the acrylic, all of the above. Next, keep them out of your mouth! Quit chewing on them! Do you realize that 85% of people have feces under their nails at any given time? It's like having a "Poopsicle" in your mouth! If you get lifting or lose a nail, for goodness sakes, DON'T glue it! If you trap bacteria between the nail and the acrylic, you WILL get a greenie, which is a bacterial infection. Call to have your nail repaired. If you can't get in to get it repaired, keep the lifting dry or but a band aid on the finger. You MUST use oil daily. Period. You will FAIL with acrylic nails if you do not oil daily. I do not state this just to sell you oil, heck for two years I gave everyone oil to prove how important it is. Oiling keeps your acrylic flexible. It keeps it from drying out. It keeps your natural nail from curing away from the acrylic. Oil should be applied to cuticles and under the free edge at least twice a day, especially right before bed. Ask yourself......Is my acrylic brittle, is the free edge of the natural nail pulling away from the acrylic, do my cuticles look crusty? If so, you aren't using enough oil!! Finally, you MUST wear rubber gloves when your hands are in any harsh cleaning products. A good rule of thumb is if you wouldn't wash your face with it, you should be wearing gloves. Bleaches and cleaners will breakdown the acrylic. I am talking RUBBER gloves, not the latex gloves. If you are wearing latex, you may as well wear nothing. Don't forget gloves when gardening as well! In conclusion, don't pick, don't chew, don't glue. Wearing acrylic nails and not oiling daily or wearing gloves when cleaning or gardening is like getting $500 of dental work done, then never brushing your teeth again.